Directed by John Krasinski and starring a formidable Emily Blunt, this almost entirely dialogue-free horror flick speaks volumes. Silence isn't simply deafening in A Quiet Place. As a family attempts to evade aliens that attack every sound, the absence of noise couldn't scream louder. The film's stillness is forceful and unrelenting, creating a stunning soundscape. One type of silence fills a room, farm house, abandoned supermarket and sprawling country property with dread and anxiety. Another thrums with the comfort of routines designed to impart normality in a clearly abnormal situation. Moreover, this symphony of quiet doesn't just play at different volumes, but with different instruments. As voices drop below a whisper and words are signed rather than spoken, the surrounding din of a desolate, post-apocalyptic world buzzes faintly: the whistling wind, the rushing water, the creaking of branches. In a movie that's acoustically muted for most of its running time — a movie that infuses its hushed status into its very premise — all of the above couldn't be more crucial. As an achievement in sound design, A Quiet Place is positively thunderous, even if Buffy the Vampire Slayer did something similar years ago. Director, co-writer and actor John Krasinski makes every minute of silence and every sudden burst of noise count, executing a straightforward B-movie concept with exceptional technical precision. More than that, The Office star ensures that his third stint behind the camera echoes both literally and emotionally. Here, a protruding nail is a heartbreaking sight. A bloodied hand streaking along a pane of glass proves horrifying as well as surprisingly hopeful. A suppressed grimace of pain gets the audience's adrenaline pumping, as well as their empathy. Viewers first meet A Quiet Place's central family on day 89 of their ordeal. When the central unnamed couple (Krasinksi and Emily Blunt) and their young children (Millicent Simmons, Noah Jupe and Cade Woodward) take a cautious trip to stock up on supplies, it ends in tragedy, establishing just how deadly absolutely any sound can be. Skip to day 472, with Blunt's character now heavily pregnant, Krasinski's patriarch trying to keep everyone safe, and the remaining kids quite rightly nervous. Still, they're as happy as they can be in their terse, jumpy, grief-stricken state. They're together, and thanks to the eldest daughter's hearing impairment, they're able to communicate via sign language. But the impending baby is certain to cry, the children waver between wanting to help and wanting to run, and the extra-terrestrial critters are rarely out of earshot. Krasinski's stripped-back use of sound reflects his entire approach, crafting a masterfully sparse movie from start to finish — and a downright masterful one too. Forget questions about why the monsters are there and where everyone else is: they couldn't matter less in this taut, fast-paced thriller, and they shouldn't even cross your mind. Disposing with the need to provide clunky explanations or exposition (something which can and has thwarted many horror flicks), A Quiet Place hones its focus on the protagonists, their immediate plight and their quest for survival. Indeed, the script's economical nature allows the film to flex its other muscles — or sharpen its other senses, fittingly. 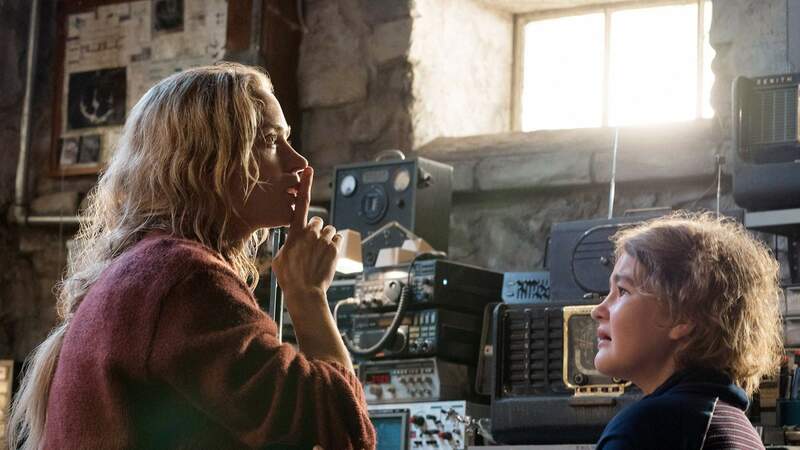 Visually, A Quiet Place flits between claustrophobic close-ups and the wide-open expanse of the family's farm, a contrast that ratchets up the tension as well as the movie's impact. When it's used, the score proves stirring without over-stressing the scenario's urgency, or making the bumps and jumps feel cheesy. Above all, however, it's the cast that not only benefit from the film's preference for showing rather than telling, but make their mark as a result. Like her work in Looper and Sicario, Blunt is both formidable and feminine, demonstrating that one doesn't negate the other in one of the best performances of her career. Watch out for the scene-stealing Simmons, though. The deaf young actress, who was similarly great in last year's Wonderstruck, is the strong, silent, expressive heart of this stellar picture — and its secret weapon in more ways than one.